Godfrey N. Hounsfield grew up on a farm outside Nottinghamshire, England, the youngest of five children. As a boy he was a mechanical whiz, able to repair the farm's threshing machines and binders. He built a homemade recording machine, and said he nearly blew himself up using water-filled tar barrels and acetylene to see how high they could be propelled by water jets. He studied radio in vocational school, and taught radar mechanics for the Royal Air Force during World War II. After the war he attended another technical school for training to work as an electrical engineer. He was hired at Electrical and Musical Industries (EMI) in 1951, and spent his entire career there. He worked on guided weaponry, radar, and collaborated on the design team for the company's first all-transistor computer. When he found himself without an assignment at the company, his supervisors asked whether he had any interesting ideas to pursue. Hounsfield proposed something that had been brewing in the back of his mind for some time -- computer software to compile x-rays of the same object from multiple angles and arrange the imagery into a complex, essentially three-dimensional representation, allowing doctors to 'see' inside a patient's body in far more detail than a conventional x-ray. With a grant from the British Department of Health and Social Services, Hounsfield spent the next several years researching, designing, and finally constructing a prototype computerized axial tomography (CAT, or CT) scanner. The first object scanned was a human cadaver's brain, the second was a cow's brain fresh from a butcher shop, and when Hounsfield saw no visible damage, the third object scanned was his own head. CAT scanning was first used in medical practice in 1971, at Atkinson Morley's Hospital in London. By 1975 Hounsfield had constructed the first full-body CAT scanner. In 1979 he was awarded the Nobel Prize for Medicine or Physiology, sharing the honor with an American physicist, Allan M. Cormack, who had independently proposed and published the mathematical basis of CAT scanning several years before Hounsfield, but had found no financial backing to pursue the project. The Nobel honors for Houndsfield and Cormack were hotly debated in scientific circles, as neither man held a degree in either medicine or biology, and Hounsfield had, by traditional standards, no degree at all, having attended only technical colleges. But CAT scans have become a mainstay of the medical profession, and Houndsfield spent his half of the $190,000 Nobel cash award constructing a laboratory in his living room. He was further honored with knighthood in 1981, his face appeared on a British postal stamp in 1994, and "the Hounsfield scale" remains the standard measurement of radiodensity in CAT scans. Later in his career he was involved in research into nuclear magnetic resonance imaging. He never married, but for relaxation he taught himself to play the piano, and said he enjoyed "lively way-out discussions." 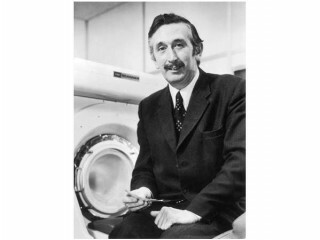 View the full website biography of Godfrey N. Hounsfield.